Are you bewitched, bothered, or bewildered by the fourth season of the Good Witch TV show on Hallmark Channel? As we all know, the Nielsen ratings typically play a big role in determining whether a TV show like Good Witch is cancelled or renewed for season five. Unfortunately, most of us do not live in Nielsen households. Because many viewers feel frustration when their viewing habits and opinions aren’t considered, we’d like to offer you the chance to rate all of the Good Witch season four episodes here. What do you think? Which season four episodes of the Good Witch TV series do you rate as wonderful, terrible, or somewhere between? 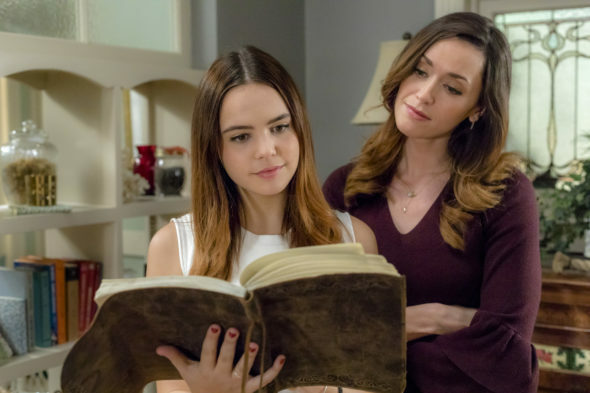 Should Hallmark Channel cancel or renew Good Witch for a fifth season? Don’t forget to vote, and share your thoughts, below. More about: Good Witch, Good Witch: canceled or renewed? I love this magical show it is soooo refreshing. I didn’t get to see the episode of Abigale’s dad death. Will there be a re-run? I would love to see all the seasons re-runs again. Sorry the writers ran out of ideas. Please dont cancel good witch like you did with cedar cove.. love that show. Wished you wouldnt of cancelled it! Oh yes please renew Good Witch for season 5. This show is wonderful with a fantastic cast. I would love to see fifth season !! Love Good Witch !! I would like to see Good Witch return for a fifth season. However, I don’t like what the writers are doing to Grace’s character. She seems to be a little “bratty” in her relationship to Nick.I also think the doctor character Dr. Radford does not seem realistic to me. He seems to have a lot of free time for a doctor. He spends a lot of leisurely time with Cassie. Doesn’t he ever have emergency calls? The life of a doctor usually is not that carefree as he is presented here. Right on Grace. Doc is in a small town so there maybe more lulls than a bigger city. Besides the story line this year is about the wedding. Yet we must endure ANOTHER season for their nupuals. I agree about Grace. I didn’t like the last episode. Cassie and Sam didn’t get married yet. I hope they do on Halloween like Cassie said. That will make it more interesting.